We didn't know the Cypress Inn in Carmel was dog-friendly till we arrived, but when we saw the doggy treats on the counter (no, they didn't offer us one) we knew this historic place was catering to the town's many pet-loving visitors. But the Inn was very people-friendly too, and before we'd finished registering the guys behind the desk had given us some tips on where to eat that evening. Just for the record their top recommendation, if we could get in, was the Dametra Café, the latest hot place in town. We did get in, and it was one of the best meals of our entire west coast trip – so thanks, guys. We should have known the Cypress Inn was likely to be Carmel's most dog-friendly hotel as we knew it was co-owned by Doris Day. She owns it with Denny LeVett, the man who also owns the Vagabond's House Inn in Carmel, which we adored. Doris Day is well-known as an animal lover and campaigner, and founded the Doris Day Animal League. Her movie and music memorabilia are all over the hotel, with fun film posters and film stills on some of the walls. Whether you're a pet-owner or not, you should take a look at the Cypress Inn's Pet Policy, which pays equal attention to the needs of pet-free guests! Doris Day's son, the musician and record producer Terry Melcher, was also involved in running the Cypress Inn till his sad early death in 2004. His life is remembered in Terry's Lounge, where you can have breakfast, lunch, afternoon tea, dinner, or just a drink. Artifacts from Terry Melcher's life in the music business grace the walls, and we were particularly interested to see gold records from his work with Brian Wilson, the Beach Boys, and The Byrds: Terry Melcher produced the Byrds' first hit, their cover of Bob Dylan's Mr Tambourine Man. Oh yes – the breakfast impressed us too! We're cat people rather than dog people, but there was no sign at all of any doggy presence in our room, and we learned later that the rooms are more thoroughly cleaned after each guest than they are in a regular hotel. We both have sensitive noses and, believe me, if there was any hint of a previous pet in the room, we'd have noticed. Instead we enjoyed the scent of fresh-cut flowers, and a glass of the complimentary sherry that greeted us – very welcome after our exhilarating drive through Big Sur that day. The room was bright and spacious, with nice clean and contemporary looks and lines. There was free wifi, fruit, snacks, bathrobes, and a nice big flat-screen TV. The Cypress Inn stands on the site of the very first gallery to be built in arty Carmel-by-the-Sea, which was in 1906. In 1929 the present building went up, and was called the Hotel La Ribera. It has a lovely 1920s California-Spanish look and feel to it, while being thoroughly modern in décor inside. It's got a very central location, close to shops and restaurants, and with free on-street parking nearby. The Cypress Inn is a member of Unique Inns. 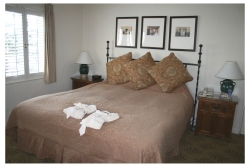 For more details and for online booking information for all the Unique Inns in California, Oregon and Washington, as well as their inns in Idaho, and British Columbia in Canada, visit the Unique Inns website.